Back in my high school days, one of my favorite games for the Gameboy Advanced was Final Fantasy Tactics Advanced. It was an imaginative and playful game, and I really appreciated the opportunity it gave me to outsmart the meager AI. However, one topic that always came up when talking about that game with my friends was how “everyone” preferred the original Final Fantasy Tactics (released for the PS1). At its core, this game is a series of maps filled with enemy units. The player is given a win condition (usually “Rout the enemy” or “Defeat this person”) and are allowed to control their own handful of units to accomplish that goal. Both friendly and enemy units take turns with one unit making a movement and tanking an action at the a time. As the player’s units fight, they accumulate EXP and JP (job points) which they used to become more powerful statistically and access more abilities respectively. 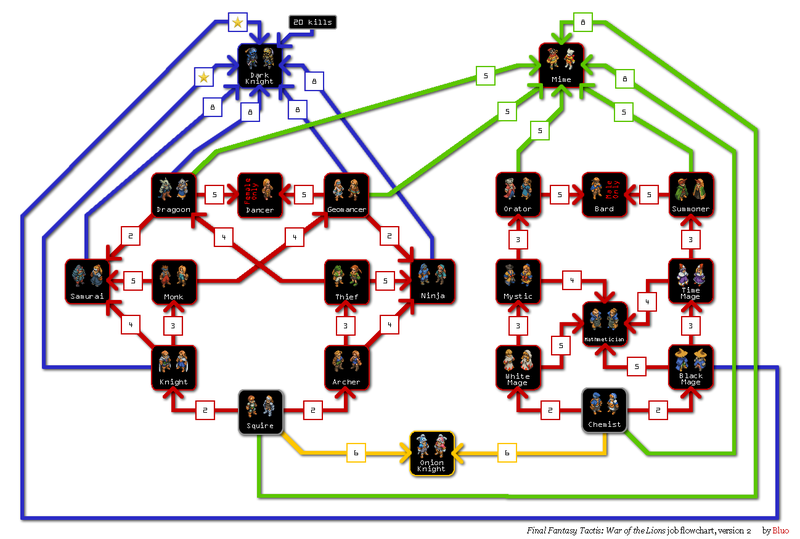 In addition to the actors in the story’s plot, the player also gets control of additional “generic” units who play no role in the plot. 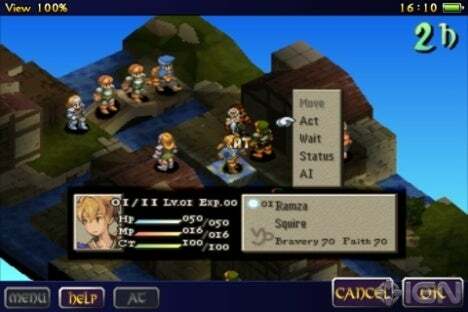 The game’s story follows the endeavors of Ramza Beoulve as he and his allies work to prevent the conquer of their world by malevolent forces. Initially, conflict focuses around the titular warring lions (factions) whom in light of the recent death of the royalty, struggle to install heirs that will best benefit themselves. The focus then shifts when Ramza discovers that the conflict is all a conspiracy set up by the Church of Glabdos to revive the heroes of old and create a new world order either by adoration or force. It also turns outs that the heroes of old are demons. The amoral-power-hungry-bad-guy kind of demons. I found three main reasons to play this game: to find out how things happen in the end (I mean, I guessed that the good guys win probably… as soon as I noticed a good guy-bad guy split), to train my budding heretic army, and because the combat engine is fun. The story telling in this game is great. Right off the bat, the world is established with the old fashioned dialect that the characters use (which also happens to make the cameos by more recent characters all the more amusing). Lots of the story is told through gameplay, and the cut-scenes are quite pretty as well. There are a lot of characters to keep track of, but I think that’s a good thing when trying to demonstrate the complexities of maneuvering politics. I like that the darker earthy visual style properly sets the tone of the game by distinguishing it from other more vibrant and upbeat games, and the harp and bugle motifs in the background music accent the atmosphere further. However, as is the tragedy with all presentations, the flaws can often be more memorable than the correctly arranged parts. One of the main themes of the narrative was power, specifically supernatural power. Mechanics-wise, most spell effects and magic damage were linked to a statistic called faith. In the beginning of the game, this made sense. Magical power is correlated to an individual’s connection and belief in the supernatural. However, once the corruption of the religious leaders (even so far as the central figure of the religion) had been revealed, it seemed weird that Ramza and his allies would continue to petition the same sources of power for their magical abilities. Further, it seemed strange to be going toe to toe with supernatural demons with seemingly normal soldiers. While the magnitude of power of the characters was noted by the enemies, the source of that power was never discussed, which raised the question of what made the demons so supernatural and threatening in the first place. There is a great satisfaction in customizing the soldiers that compose the player’s army. Each unit, story character or not, can be assigned to any job that they meet the requirement for. This means it’s possible for me to take a character I’ve recruited as a Black Mage and tell them to become a Knight (assuming they have enough training as a Squire). This is advantageous because characters can use skills not just from their current class, but also can equip sets from other classes as well. This makes it possible to train an Archer-Chemist, or a Ninja-Knight or anything else you think would help you best tackle the situation at hand. It’s not as quick as it sounds though. As alluded to earlier, most classes have requirements of training in other classes as prerequisites to use. To begin learning Monk skills, a character would need some training as a Knight, for which they would need some training as a Squire. These requirements help to mitigate the overwhelm factor of learning what a bunch of different classes do all at once in addition to making it feel like an accomplishment to unlock the later tier classes (which happen to have flasher/complexer abilities). All of this variety and customization lays the groundwork for the decisions made during combat, which has it’s own tactical appeal. As the name of the game would imply, much of the game is about making good tactical decisions. How far to advance the army? Should this turn be used to attack? To retreat? To heal allies? Which enemies should be targeted first? These are all great questions to have the player asking him or herself while playing a game focused on tactics. War of the Lions is quite successful on that front. It matters if your archers run ahead of your knights and expose themselves to attack. It matters when you give enemy mages free time to charge up their spells for killing your army. But at the same time, it doesn’t matter so much that the game is unnecessarily punishing. Even after making a mistake or two, it’s still usually possible (although probably not optimal) to win each battle. Anyways, remember that time I said I was training a heretic army? I wasn’t joking (that much). It just so happens that one of the most effective strategies in this game is to have a bunch of super courageous atheist-knights run around and kill everything. Hopefully, that was a funnier way of saying “This game is a mess combat balance-wise”. Many strategies or options blatantly obsolete other ones (for example, Orlandeau being straight up better than Agrias and Meliadoul combined, which is exacerbated by recruiting Orlandeau before Meliadoul). And while it’s just as fun to min-max things that are over powered as thing as those that are balanced, it does mean that some of the tactical variety may not be explored because it is simply worse than other tactics. While it may seem contradictory to praise the game for making choices matter, but then criticize it for having clearly best options, some of the following considerations should be taken into account too. The main reason mitigating the harshness of my critique for this game is the fact that it’s an archetype game. It was one of the forerunners of the “Strategy RPG” genre as well as exploring motifs of religion, corruption and power. Of course, that doesn’t make the quality of the game better, but it does mean that the developers has less warning of some of the pitfalls that were along the course of developing such a thing. So was the game worth my money? I probably got around 80 hours of enjoyment and 10 hours of grinding out of this game. While that’s not the 400 hours / $80 (including dlc) I got for Elder Scrolls V: Skyrim that’s way better than the 2 hours / $20 I get from a typical movie. For those who are able to tolerate more grinding than me, the game will probably stretch even further. I also think it’s notable that the game is on iOS. Much like its successors on GBA and DS, War of the Lions is a very travel friendly game because of its turn based nature. The touch controls are especially intuitive, arguably more so than with a console controller. This makes it pretty easy to sneak some orders to your units while waiting for the bus, or eating lunch, or working (shame on you!). Yet at the same time, the game has enough depth that it doesn’t feel like a waste to curl up on a couch to play it. However, my biggest problem with recommending this game is that it’s obsolete as a current Strategy RPG entertainment experience. In other words, by now, there are better Strategy RPGs out there to play. I’m really glad that I got a chance to play the game because of the insights that it lent me into the evolution of the genre, but more modern games are more polished and more engaging. It’s successors Final Fantasy Tactics Advanced and Final Fantasy Tactics A2: Grimore of the Rift, although different in atmosphere, add many mechanics and layers of depth to improve the experiences of adventuring with a mission, unlocking new classes, and customizing an army. For emphasis: it’s not a bad game, but for those of you looking to maximize fun for money/time spent and are less interested in looking deeper at games, there are better games out there.